Earlier I gave Jonathan Hickman’s a three-issue ride, before I stopped reading. My main complaint was there was enough going on between issues in other connected titles that I was not reading that the story often did not make full sense. But I did provide it a second chance recently in the collected, Infinity. Things are not going well in the Marvel universe. The Illuminati, a group which includes Doctor Strange, Black Bolt and Iron Man are attempting to make hard choices as parallel earths invade our space and nearly destroy all existence on a regular basis. Additionally, in space a force called the Builders are carving a path of destruction that leads to Earth. So Captain America leads a group of Avengers off world to face this threat with the armies of the Galactic Council. Their fight is difficult and tough as they suffer several defeats at the hands of the Builders. Kree, Skrull and Shi’ar all work together to fight this threat. To make things worse, Thanos uses this opportunity to attack a defenseless Earth to seek a tribute from Black Bolt’s Inhumans. The cost is the lives of the young Inhumans, and Black Bolt makes a choice that could change all of the Marvel universe as he battles the Thanos’ threat. Just let me start by saying, this book is really S.H.I.E.L.D. light and it does not feel like it should be. Maria Hill is only mentioned. And no S.H.I.E.L.D. agents are seen battling the forces of evil. Now we do know thanks to Secret Avengers that Fury Jr. and Coulson were taking the Thanos invasion head-on. But it really should have had some S.H.I.E.L.D. involvement in the pages of a terrestrial invasion. Are they not the shield, do they not matter! I still have problems with the two stories. I do understand that the Builder threat allows Thanos to attack. So that story provides the opening for Thanos. But this one story feels like it should have been two massive crossover events. And the Builder storyline finishes well before the Thanos story, so they are not even fully parallel. I think these would have been two strong story arcs if they were published separately. I will even go a step further and say the Thanos invasion would make a great Marvel Cinematic Universe plot. And Thanos’ generals The Cull Obsidian would look fantastic on the big screen. But the two stories together felt a lot like jumping around to me. I will say however, this story feels more real than Forever Evil. This story, unlike DC’s event feels like it could happen in our world. And that of course is a strength of Marvel comics. And I will go a step farther and say the cosmic elements felt very Star Wars at times! The young hero Manifold’s worries, how does one cope in these days of constant battle and movement. I think we can see his concern. Captain America attempts to inspire him with words that are pragmatic and stifle a fanboy’s soul, “There is no Hero’s Journey…There’s Just life and how we chose to live it.” Yes, this is somewhat correct in one must choose to live well, but I found Cap’s words far from inspiring. It is Thor who wins the day for me, “Your entire life has led to this day. You were born for this.” Thor sees purpose in his life and does not doubt why he is there fighting the Builders. And this is what I love about comics, using colored pictures to both debate the larger items of life and teach a lesson. But I am still going to side with Thor in this debate! 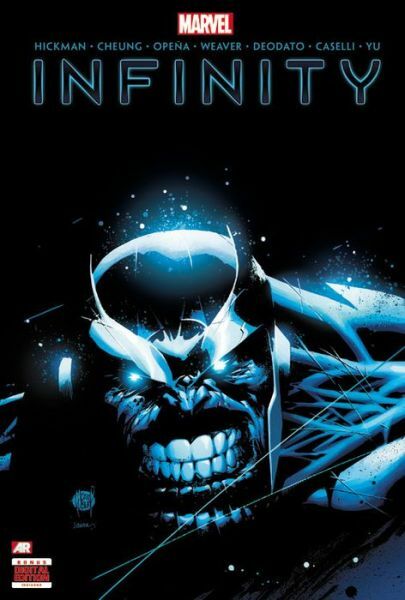 Infinity as a collected story grew on me. It is not my favorite massive crossover in Marvel’s history. But I see a lot in it I enjoyed. It is a big tale which likely has future implications in the Marvel universe as a new threat is released and new heroes revealed. I just wish Maria Hill as the world’s greatest spy had a bigger role in the plan to save the earth from Thanos’ forces.